It was with a heavy heart this morning that we learned the news of President Hinckley’s death last night. When President Hinckley became President of the Church on March 12, 1995, I didn’t know much about him. His face was, of course, already a fixture in Church leadership, as familiar as any other that I could remember at that time because of his central function in Church leadership during the presidencies of Spencer W. Kimball, Ezra Taft Benson, and Howard W. Hunter. He became President of the Church only a few months before I entered the MTC for my mission to Berlin. I didn’t think too much about it, although by then his voice at General Conference was already as a balm in Gilead to me in the way that it conveyed the message of the Atonement of Jesus Christ and the marvelous work and wonder of the Restored Gospel. 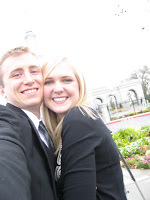 But it was while seated at a General Conference in the Tiergarten stake center in West Berlin when President Hinckley gave his electrifying and forceful rebuke of spouse or child abusers in the Church that I realized my gratitude for him and how lucky I would be to receive his counsel as the Lord’s mouthpiece for however long the Lord would prolong his days in his office of the Presidency. I’ll never forget that meeting, nor many others in which he taught the truths of the Restored Gospel in magnification of his weighty calling. The LDS Conspiracy Fails Again! Of course you all know which conspiracy I mean, right? The conspiracy of “the Brethren” to promulgate to the world and to the membership of the LDS Church “obfuscation, evasion, and half-truths,” (as my friend Equality would put it), regarding certain historical events in the lives of Joseph Smith and others. Well, this week it failed, again! Since he has been commenting on ABEV lately, I wanted to take a moment to introduce my brother, Adam F. (profile top row, right side as you look at it.) Yes, there is another brother, believe it or not. In fact, there are three other brothers and a sister! Before you know it, the bloggernacle will be full of Fowles! Adam has some very good thoughts going on over at his blog, “Thought by Thought“. Go on over and take a look! You are currently browsing the ABEV: a bird's eye view blog archives for January, 2008.